Whether you are looking to buy or sell a Long Beach Island duplex in 2019, there are some factors that you should consider before you make any decisions. The stock market’s reaction to the Fed rate increase program may have caused it to consider backing up a bit. There are rumors that the Fed may skip the next steps in their program. The economy is just not as strong as the Fed thought and a pause, at least is in order. 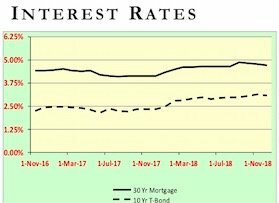 Bond rates have relaxed slightly in response and mortgage rates should follow downward if this program is halted. Real estate in general is starting to encounter some headwinds, but capital moving from the stock market should help buoy prices. While the increases in 2018 have been frustrating, it isn’t actually too bad when you look at the bigger picture. With the higher rates, homeowners would just be paying an extra $50-$100 a month to their house payment. With a new Long Beach Island duplex comes a new mortgage and a more “up-to-date” interest rate. This will continue to cause a low inventory of homes while everyone tries to get used to the new interest rates. However, the good news is that while LBI property owners are continuing to build equity while paying their mortgage each month, this will eventually lead to higher profits when they do in fact decide to sell their duplex properties. So if your New Year’s Resolution is to make big changes in 2019, get ready! If you are looking to sell, make sure you price your LBI home realistically, but be aware that you may need to price aggressively, or offer some great perks. Competition can be fierce! Even though it is still technically a seller’s market, it’s not to the extent as it was earlier in 2018. If you are looking to buy a duplex on Long Beach Island in 2019, just know that it’s okay to take your time. 2019 will bring less competition and more inventory. Ensure you make smart financial decisions and find a Long Beach Island duplex property that best fits your budget. The LBI Duplex Team can help! Contact us today at team@lbiduplex.com. US News. “What to Expect from the Housing Market in 2019”. USA Today. “5 Housing Takeaways: What Should You Expect From Home Sales in 2019”. Forbes. “2019 Real Estate Forecast: What Homebuyers, Sellers, and Investors Can Expect”.